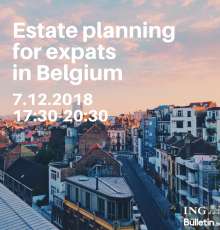 Estate Planning for expats in Belgium. The event will take place at ING Marnix on the 7th of December 2018, which is easily accessible from the Metro/Bus stop Trône/Troon. Registrations start at 17:30. The seminar starts at 18:00 sharp and ends at 20:30. - Zeno De Bock and Jasmien De Ras, Berquin Notaries, on “Civil and Practical aspects of the new inheritance rules”. - Dave Deruytter, head of Expatriates and non-residents, ING Bank, on “What should be your financial tax planning priorities”.